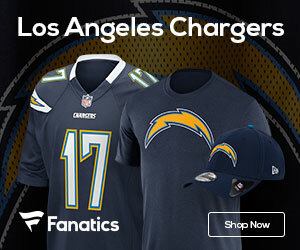 As most of the highly seeded teams in both conferences have been doing, the San Diego Chargers gave their starters limited action on the football field, giving way to the reserves. During Sunday’s game between the Chargers and Washington Redskins, some rarely used players saw some appreciable playing time, including Chargers quarterback Billy Volek, running back Michael Bennett and wide receiver Craig Davis. Even with their reserves playing the bulk of the minutes, the Chargers managed to rally late in the fourth quarter on a Volek TD pass to Mike Tolbert, leading San Diego to a 23-20 win over Washington at Qualcomm Stadium. The Redskins looked inept early, including choosing to punt from the Chargers’ 34 late in the first quarter. Meanwhile, the Chargers jumped ahead on Nate Kaeding’s 47-yard field goal and Rivers’ 12-yard scoring pass to Pro Bowl tight end Antonio Gates. San Diego took a 10-0 lead after its first two possessions and Rivers would make way for Volek to take over. Kaeding’s 24-yard field goal early in the second quarter gave San Diego a 13-0 lead. The Redskins scored on consecutive drives in the second quarter to take a 14-13 lead. Jason Campbell threw a 2-yard TD pass to Todd Yoder midway through the quarter. On the first play of the Skins’ next drive, he threw an 84-yard pass to Malcolm Kelly to the Chargers’ 4. Three plays later, Campbell found Mike Sellers wide open in the back of the end zone. Graham Gano kicked field goals of 22 and 26 yards for the Redskins in the second half, and Kaeding kicked a 45-yarder. 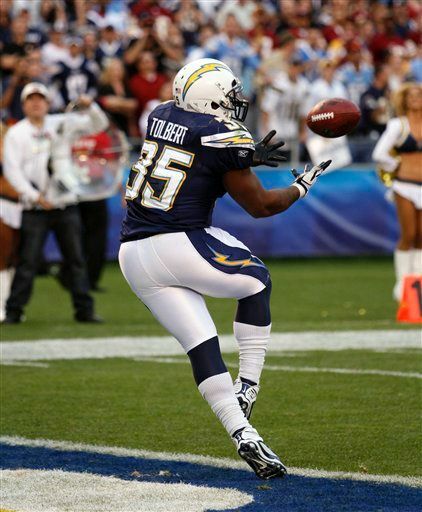 Billy Volek threw a 2-yard touchdown pass to fullback Mike Tolbert with 35 seconds left to rally the playoff-bound Chargers to the victory. Rivers, in limited action, went 9-of-15 for 99 yards and a touchdown while Volek went 19-of-30 for 216 yards with a TD and an interception; Campbell went 28-of-42 for 281 yards with a pair of TD’s. Bennett led the Chargers’ rushers with 28 yards on 11 carries with 4 catches for 62 yards while the Redskins were led by Quinton Ganther who rushed 12 times for 27 yards. Malcom Floyd led the Chargers receivers with 9 receptions for 140 yards while Davis pitched in with 6 catches for 52 yards. Kelly led the Redskins with 5 receptions for 109 yards while Santana Moss caught six for 55 yards. San Diego finishes their regular season 13-3 and will rest for two weeks awaiting the wild-card playoff results while Washington ends their season and the Jim Zorn regime 4-12.